Started last Spring, this quilt is coming in just under the one year mark. I saw the pattern in a quilting book I got when I was pregnant with Oscar. It is the drunken path pattern (if memory serves) and they arranged the path to be one long roadway. I thought that’d be so neat for Oscar to drive his cars on. The fabrics I used are from thrifted kids clothes, feedsack bits off ebay and 30s reproduction fabrics. It’s been pieced together, basted to batting and sitting on the back of my sewing table chair since last April. After spending the last week finishing up the stipple quilting, I cut 2″ binding from some Marimekko fabric (that same I used for my Tsunami quilt square) in anticipation for learning binding Saturday at quilting class. I bought the Clover binding tool they recommended and it worked like a dream! I’ll write more about the last class and binding in a future post, but this morning Oscar and I are off to something called “Monday Madness”. Wish me luck! Here it is after a trip through the washer and dryer (not sure if that’s a no no). It got all excellent and crinkly. I’m so pleased! Beautiful quilt! If I were Oscar I would want to race my cars all over the place. how wonderful! The colors and patterns are simply gorgeous, and how fun for Oscar. A place to play and to nap all in one. You are a great momma. Excellent and crinkly indeed. I think quilts look great when they get that rumpled look from washing. What a great idea from a traditional pattern! And I love the post-wash look. Did you use all-cotton batting? The quilt looks fabulous! What a lucky boy! As soon I finish my quilts, they go straight to the washer and dryer. Another hint…do not prewash your fabrics and use 100% cotton batting (depending on how dense your quilting is) and they will really get that antique, crumpled look. Oh, what a beautiful qiult. I love it. Oh my, another incredible creation! Lucky boy. It’s absolutely crazy fantastic!!! All details, incredible patience. Wow that is so cute! i wish i could take a quilting class, I am so hopeless when it comes to quilts. But this really inspires me, and makes me want to try again!! What style of quilt would you recommend for a first time quilt? Thanks! yippie for getting your project done! i have had material for eliot for more than three years now…i think it is time to get started! what is this clover binding tool, could you explain that a little more? how great! I also wash and dry after I’m done, and never pre-wash my quilt fabric-for the extra wrinkled look-same as kim suggested. wow. It’s all I can say. 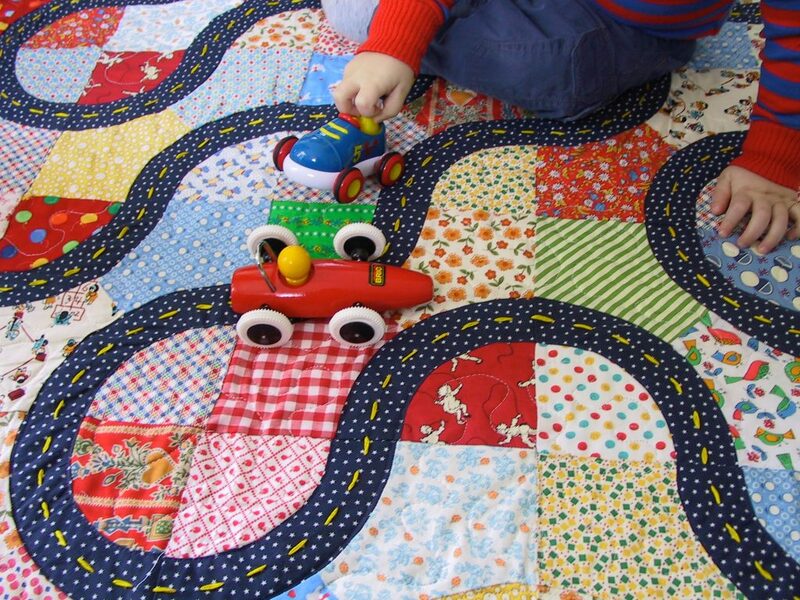 I first thought that you had laid out a race track for Oscar to play on over your quilt and then it finally hit me that the racetrack was part of the quilt!! That is the cutest! It reminds me of flying over the Midwest and seeing the patterns of the different fields from above. Hillary, I am so impressed with all your projects. 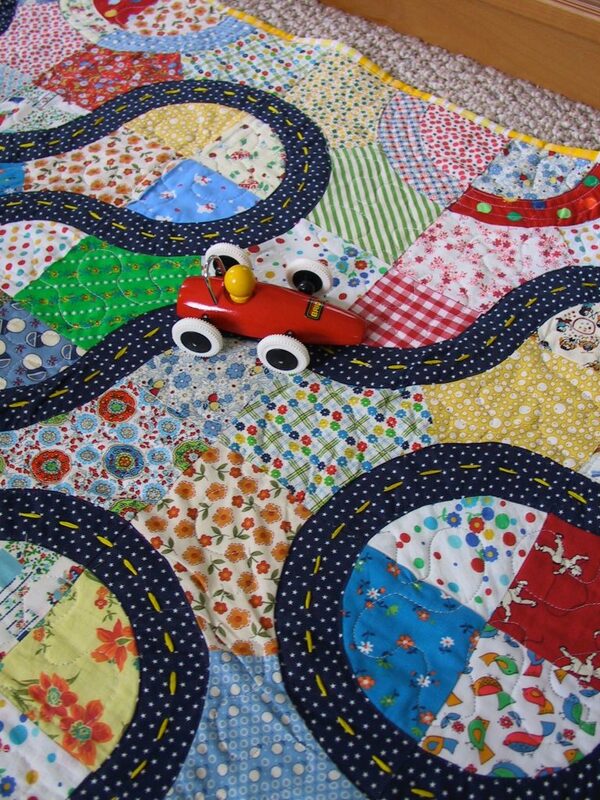 But this race track quilt for Oscar is too wonderful. If I had a little boy around I’d be tempted to try it. Gosh, I don’t even have a little boy around and I want one. When are you going to start marketing all the wonderful things you make? great idea. and terrific fabric choices as well. love how vibrant the whole look is. lucky boy! This is the coolest! You’ve outdone yourself! Oh, and good luck with Monday Madness. holey moley, Hillary! Just stunning. So awesome it requires the calling-over of co-workers for adequate oohs and aahs! Beautiful. The racetrack will be used and used, I’m sure. And I love the Plain and Simple Quilt. What is the clover binding tool you mentioned? And is the Plain and Simple a quilt pattern from your class? Argh! AWESOME. Not just AWESOME, but BOSS-some! 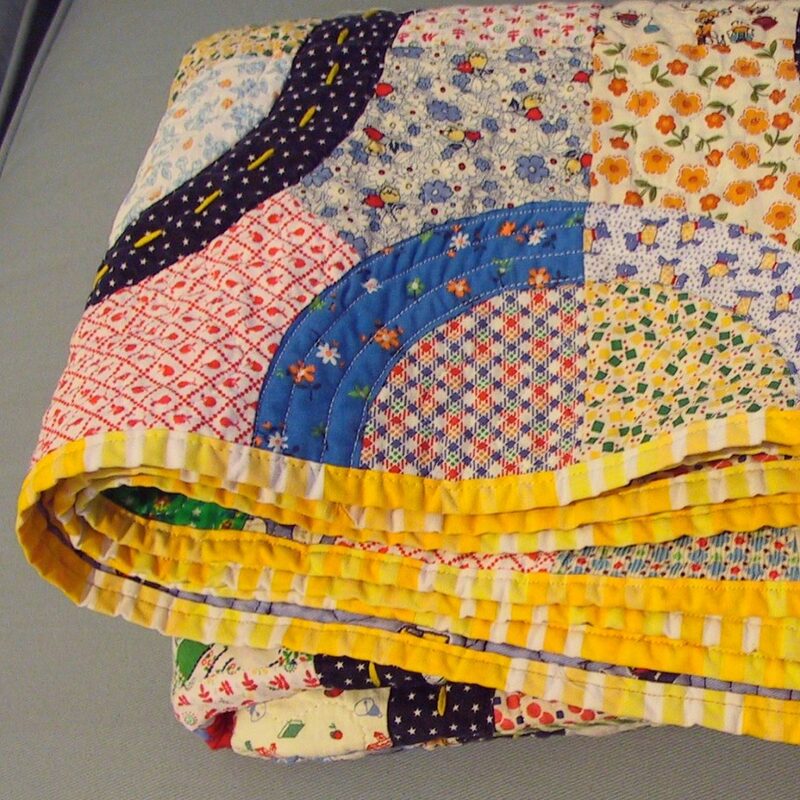 I’m all for washing quilting and the great post-wash crinkling. BUT I’m in the camp that wants quilts to be used, rather than protected. can i come over and drive my cars on it? Your quilt is so charming, what a great idea! I love all the fun fabrics and colors. That’s absolutely amazing. An interactive quilt! Fabulous! It will see years and years of play. I’d love to zoom a car around and check out all those fabrics. Wow! this is a great quilt – quite amazing. And it totally sends my head into meltdown when I try to work out how you pieced it all together. 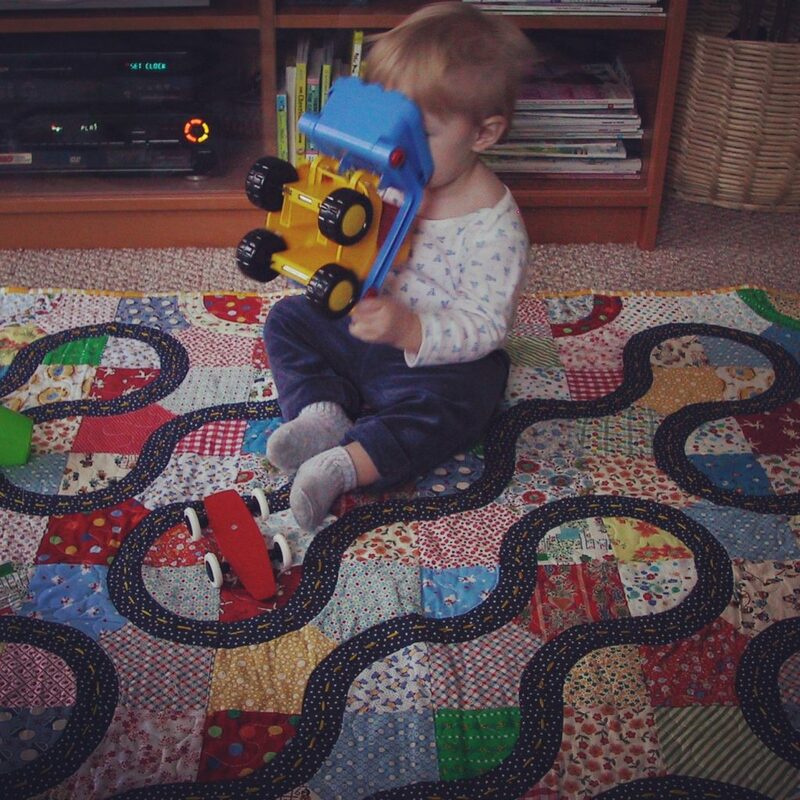 What an amazing quilt – I love the little spotted road! wow! its amazing!!! what a lucky lil boy oscar is. i’m sure he will spend hours and hours playing on it. What a fantastic quilt! I can imagine how dificult it was to do it. Lucky son you have! This quilt is sooooo cute! *swoon* I keep coming back to your site to admire it. I started my first quilt last summer and now I’m inspired to get back to it so I can finish and move on to the next design. I’m doing it all by hand though, so it may take a while. It seems like so many craft blogs focus on knitting, but happily I’m starting to discover quilting bloggers such as yourself. Thanks for the inspiration and I look forward to seeing what you do next! Cheers! Wow!! This is such a fantastic quilt! Oscar will cherish this for many many years to come. My son is almost 6 and would still love something like this. Thanks for sharing your boundless creativity with us all!! How can I get a copy of the pattern for the Racetrack quilt? I just love it. I stumbled on this post in a search for doll quilts (dolls + quilts = Hillary Lang!). I adore this quilt idea and am trying it out (I used the planning post from my blog for the URL). I’m doing the background as areas of land, though, and hope to have an ocean and mountains to add to my lake, park and farm. Do you remember what book the pattern came from? I would love to get my hands on it!